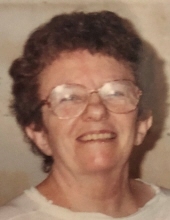 Nancy Scheff, 77, of Silvis passed away May 20, 2018 at Unity Point Rock Island. A memorial service will be 1pm Wednesday at Aspen Health and Rehab in Silvis. Quad Cities Cremation Center is assisting the family with arrangements. Nancy was born Nov. 5, 1940 in Moline, IL the daughter of LaVerne and Nancy Bickford. She was married to Lyle Scheff for 20 years. Nancy enjoyed playing bingo, crafts and working in the kitchen at Moline Gospel Temple. She also enjoyed attending the Special Olympics to watch her daughter compete. Survivors include her daughter Bessie Scheff of East Moline; sisters Bessie Albers of Moline and Janye Hamric of Kewanee and many nieces and nephews. Nancy was preceded in death by her parents, 2 brothers and 1 sister. To plant a tree in memory of Nancy Scheff, please visit our Tribute Store. "Email Address" would like to share the life celebration of Nancy Scheff. Click on the "link" to go to share a favorite memory or leave a condolence message for the family.